We follow the sound of beating drums and a rhythmic rattling and pounding to the Zocalo, the central plaza, Mexico City’s own beating heart. 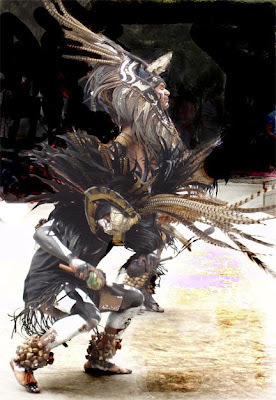 There, groups of dancers costumed in Aztec garb leap and twirl around a smoking altar in sandaled feet, rattling the strings of seed pods and goat horns strapped to their ankles, pulsing gourd rattles and pounding on enormous carved drums. They are dressed in animal pelts and fluorescent fabrics, gold plastic, feathers and face paint. The sound echoes off of the walls of the Catholic church, the Presidential palace, and the crumbling remains of the pyramids of Tenochtitlan that support the weight of a steady stream of camera laden tourists as they stare and wonder at remnants of an ancient history and it’s reenactment all happening at once, right here before their very eyes. Scattered between the groups of dancers, self proclaimed Curanderos dressed in a variety of exotic costumes are waving smoking herbs over the heads of their customers, stroking them with bunches of basil leaves, performing limpias, cleansing the ailing spirits of tourists and locals alike. They vie for attention with their costumes made from various animal parts and altars which hold clay bowls of smoking copal and sage, photos of saints and Aztec kings, flower petals and shells. Large hand painted cardboard signs announce their services. These presumed shamans appear to be multi talented, offering spinal alignments and massages, astrology and palm readings, as well as the usual spirit cleansings. One shaman sports a dead rabbit’s head on his forehead, it’s blind eyes peering out through a fan of peacock feathers. He wears the red painted skull of a small animal at his groin. We watch as he holds onto the head of a middle aged woman, rocking it back and forth, and then suddenly jerks it sideways as she grimaces with pain. My curiosity to step up for a shamanic healing ends in that moment. When the lines of customers grow thin the shamans stoke their smoking altars and blow into conch shells to announce their presence, beseeching the weary gods for more customers to heal. The cardboard signs assure you that your participation is voluntary and gratis. I wonder if it is because it is a sacred shamanic law that says they must offer their services for free or lose their spiritual healing gifts, or perhaps (more likely) it is because the Mexican law has recently banned street vendors and merchants from selling goods and services in the zocalo. Either way, you can be sure that they willingly accept donations for the cause. Despite the law, blankets and tables are laid out along the sidelines with a myriad of goods for sale, where long haired tattooed and pierced sellers hawk their wares. Here you can buy post modern precolumbian chachkes galore. Faux ancient artifacts like plaster Aztec calendars spray painted gold, cheap jewelry made of questionable jade, obsidian and coral wrapped in nickel silver wire. Rattles and drums and flutes, and clay ocarina flutes shaped like animals. Smoking pipes made from epoxy clay entwined with serpents and pre-Columbian figures. Spray painted plaster skulls and little pyramids of resin with entombed scorpions sealed inside. In short, anything you could possibly need to set up an Aztec altar right in your very own living room. It is decadence at its best. A fantasy revival of an ancient culture turning a profit here at the very site of their reign and demise. Beneath the wary gaze of the Catholic church, the government, and the crumbling ruins of the Aztec empire itself. Mark is fascinated by a woman throwing pairs of small oval magnets into the air that click together with a buzzing insect like sound. He buys a pair for the equivalent of a dollar, and proceeds to spend the rest of the day annoying me with them. For dinner we buy delicious tamales wrapped in banana leaves from a vendor with an ingeniously designed wheeled cart. Beneath the steaming pot of tamales is a charcoal brazier, and attached to the sides are plastic bags filled with plates and forks. I barely take my first bite when suddenly the cart is in motion, a trail of sparks and steam rushing past us, only to disappear around the corner of a building just as two uniformed policemen saunter by. Behind their unsuspecting heads stands the vendor’s buddy and informant, holding up an empty plate and plastic fork, still advertising the now invisible wares. “Mas tamales?” he mimes, and I nod, holding up two fingers. Then he is gone, reappearing moments later with a fresh steaming plate. Somehow they taste even better just knowing that they are illegal.